If you have a ton of cherries, and you know I do. If you like to bake easy cakes, and you know I do. The original version is a strawberry cake from Martha Stewart, which I saw on Jen's site, which her daughter expertly made last weekend. Why not substitute blueberries or cherries? 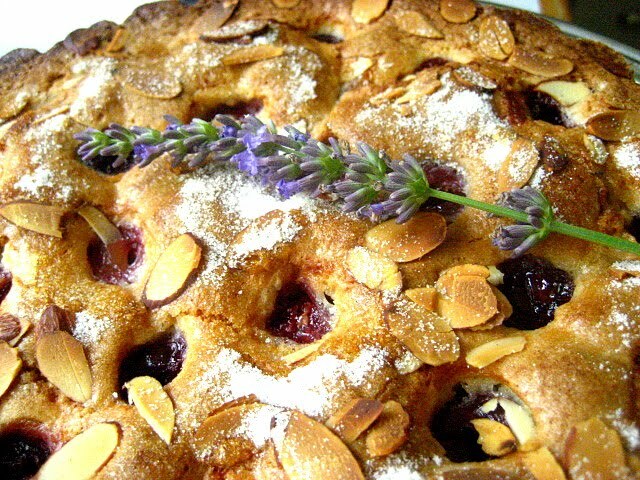 I added sliced almonds to the top of the cake and baked it in a tart pan with a removable bottom. This had the 2 "E" seal of approval. Easy & Excellent. We loved this simple cake, and so did everyone who tried it. Mix together the last 5 ingredients until pale yellow and add to the flour mixture. Brush a pie plate or tart pan with olive oil (or butter) and pour batter into prepared pan. Arrange cherries and sliced almonds on top of cake, pressing the cherries into the batter. Sprinkle the remaining 2 tablespoons of sugar on the cake. Bake in a 350F oven for 35-45 minutes until top is golden. Cool in the pan 15 minutes before removing. I never learn. I should not look at food blogs before breakfast. Want this right now, please! And me on my way to the grocery store... I bet this would be delicious with Saskatoon berries which should be ripe very soon. Thank you so much for the shout-out Stacey! I will show Cailyn your version of this cake. 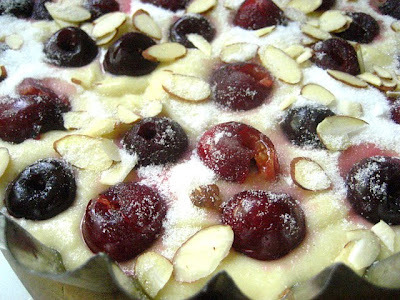 It looks incredible with cherries and almonds. Great idea! I wish I had a slice of this with my morning tea. Thats my favorite tart pan you have, I just love it, along with the cake and crunchy almonds on top! This looks AMAZING. i want it for dessert! Love cheery, never had a chance to turn them into dessert, because my family will just eat them fresh. Just the recipe I need for the bag of cherries in our fridge. 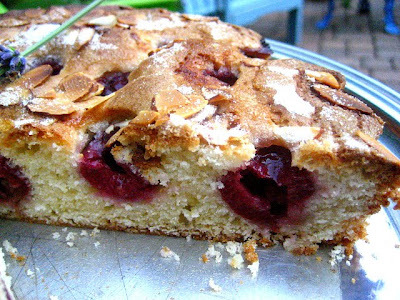 Made a very similar cake recently and it was a big hit; love the combo of almonds and cherries. I just drank a frozen margarita so I could sit down and catch up on my backlog of RSS feeds for my fave blogs. Every time I bookmark one of your cakes, you post another one. 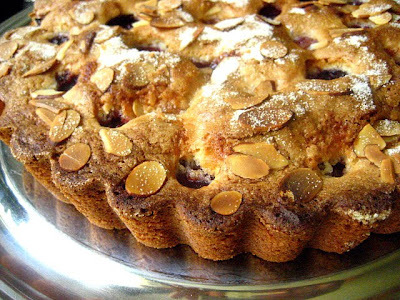 You got me at cherries, tart, easy, cake and almond. Soooooooooo making this. Your cakes are always easy but never short on flavor. Mine!